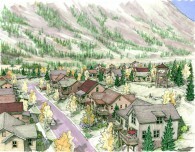 Phase 5 is SOLD OUT, but you have options for a NEW mountain home! Phase 5 – Coming Soon! Peak One Neighborhood – Only Two Homes Left in Phase 4! 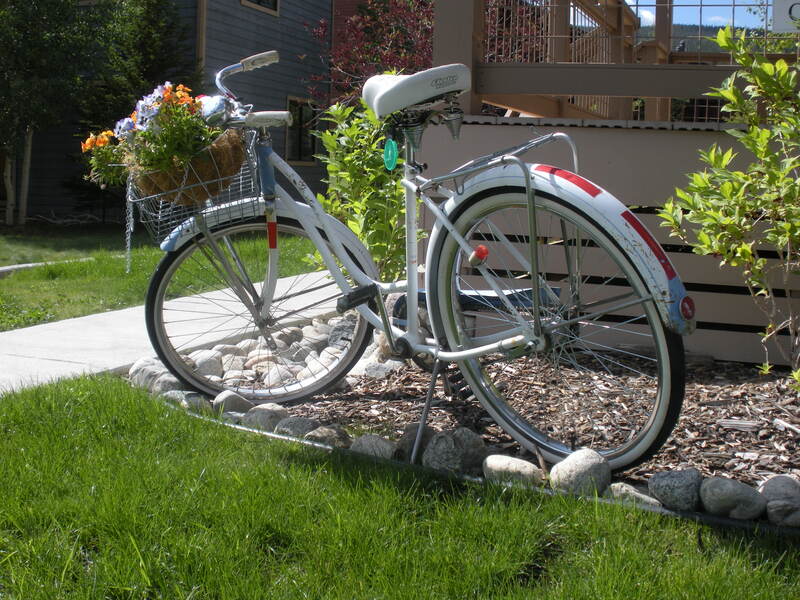 Walk or Bike to School, Trails & Main Street! The final phase of the Peak One Neighborhood sold out in less then a week! The excitement for Phase 5 was not a surprise. The unique land plan, incredible views and the range of floor plans from the cozy yet efficient “Glencliff” to the spacious hillside “Gunnison,” made Peak One Neighborhood appealing to everyone. Lincoln Park will have all of the general design features of Peak One Neighborhood; great location, ENERGY STAR© construction, appealing land plan, floor plan variety, but with creative floor plan, technology and interior finish updates. 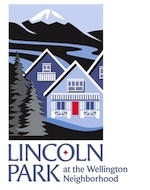 Visit Lincoln Park and sign up for the interest list for the latest updates & information. It is hard to believe that the final phase of Peak One Neighborhood is upon us. What an amazing experience it has been! From the ground breaking in 2011, to watching the kids play on fresh sod in Meridian Park, creating connections to trails, Main St. & the bike path and finally, the evolution of the Hillside homes and Phase 5. We feel fortunate to have been able to bring together so many cool, active, extraordinary homeowners. The excitement for Phase 5 is overwhelming; as it should be! Cabin Alley Green is going to quaint, cozy with a unique & interesting land plan. The Hillside homes have evolved into superior spaces with incredible views from every window. All of the homes are efficient, creative and affordable. We earn the ENERGY STAR© certification with each home, which means you save money on monthly energy bills. Buyers get a Pre-Approval Letter from Lender & from SCHA. Set up a time after June 9th to write a Contract on your Phase 5 home. Hope this is helpful and we look forward to seeing you at the Phase 5 Release Party! Thanks to all of you who have been patiently waiting on the release of Phase 5- the last and final phase at Peak One Neighborhood. Hope that helps break down the process involved in Phase 5. We will continue to keep you in the loop as we gather more information and get final approvals. Post Race party at the Peak One Neighborhood! A portion of the proceeds will go to the Frisco Elementary STEM Program. Start a new family tradition and join us in Inaugural Turkey Day 5k in Frisco. 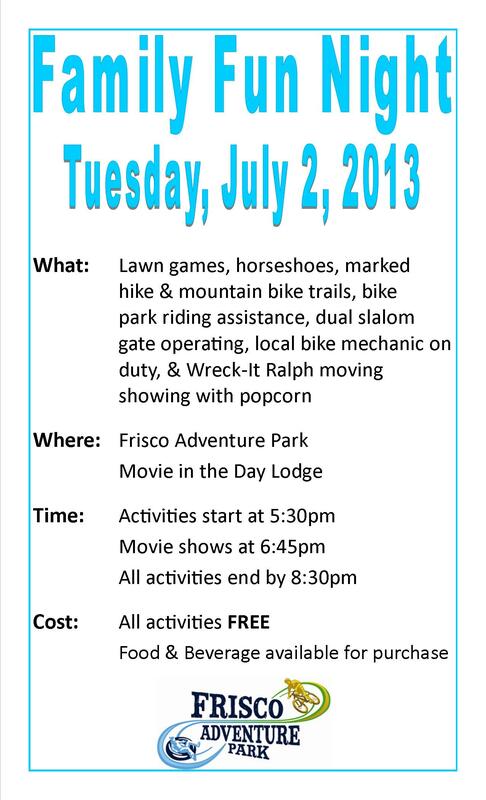 This event is open to all ages, and will take place on the Summit County Rec Path and Town of Frisco side streets. For additional information on these events, please contact Linsey Kach, Recreation Programs Manager at LinseyK@townoffrisco.com or 970-668-9133. Only two floorplans left in Phase 4 – The Braddock and the Valdora. Both of these homes are hillside homes along Belford Street. South facing, great mountain views, big decks & attached 2-car garages are just a few of the wonderful features that these homes offer. Come by the sales office, or check out the website for details. They will go fast! Buy now, and get into your new home by next spring/summer. Phase 5 – coming Spring 2014. Stay tuned for details, and make sure you are on the Interest List for Phase 5. Please call Kate for details: 970-485-2212. Enjoy the beautiful fall….winter is right around the corner. Right out our backdoor! Mt Royal is the backdrop to the charing Peak One Neighborhood. Come join us – The 2nd Annual Mt. 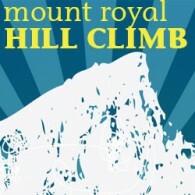 Royal Hillclimb will present runners with a 1,500ft challenge! Racers will have just less than two miles to ascend from the Town of Frisco, elevation 9,072ft to the 10,500ft summit of Mt. Royal! This trail race may seem short and sweet to some, but the grueling ascent is anything but sweet! The first man and women to reach the top of Mt.Royal will be declared King and Queen of the mountain! Race Registration: is open from May 12th, 2013 and will close at 5pm on September 5th, 2013. The race is open to 150 people. Click here to register now. Race Fees: $35 for adults 18 and over OR $25 for youth 17 and under. A late registration fee of $5 will be applied to all day-of registrations. The first 100 people to register will receive an event tech-tee! Post Race Meal: Racers will receive a light refreshments following the race at the Frisco Historic Park Lawn located off of Main Street. Racers 21+ are welcome to enjoy a Bloody Mary courtesy of the Breckenridge Distillery and Motherlode Provisions! Awards: Top 3 Overall male & female; awards will be given out at the Frisco Historic Park Lawn following the race. Top 1st, 2nd and 3rd place runners in each category will receive a pair of Salomon trail running shoes! Peak One Neighborhood is walking distance to everything – some of the best hiking & mt biking trails out your back door, an elementary school just blocks away, a stroll down the bike path to a great daycare facility, and a hop skip & a jump to Main Street Frisco for great shopping & yummy restaurants! It can’t get any better than that! Our homeowners enjoy all of these benefits every day. Whether its an afternoon hike up Mt Royal, a cruiser ride down the street to school with their kids, or a cup of coffee on Main St. Its all right out your backdoor! Come join the Fun! 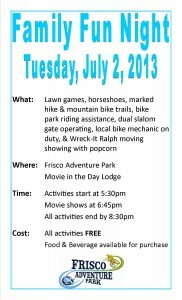 Every Tuesday Night at the Frisco Adventure Park- Tell your Neighbors, too. Even though taking possession of a new home is fun, people often dread the moving process itself. Moving can be a stressful experience. 1. Packing Central. Create a spot for your packing list, labels, markers, tape, etc. 2. Make a List. Write everything down! Before you pack anything, create a system. Number EVERY box you pack and write the contents on your list. 3. Supplies. You’ll need lots of boxes and packing materials – more than you think. Set aside about 10 boxes for last minute moving day items. Tall wardrobe boxes are perfect for bulky, lightweight items like comforters, pillows, and clothes that need to remain hanging. 4. Color Code. Designate a color for each room in your new home and put colored stickers on each box. In your new home, put a matching sticker on the door to each room so movers know where to put things. 5. Keep Things Together. Keep light bulbs with lamps, picture hooks with pictures, etc. 6. Pack Early. Save time by packing everything you can ahead of time. If it’s not essential to daily living, pack it! 7. Cleaning Kit. Put together a kit of basic cleaning supplies for moving day clean up jobs. 8. Use Luggage. Save boxes by packing items in luggage and duffle bags. 9. Keep Valuables Safe. Keep valuable possessions like jewelry and family heirlooms with you. Check your homeowner’s insurance to see how they’re covered during the move. Keep important papers and phone numbers with you. 10. Get rid of it. Donate, give away or throw away 20%. De-clutter. Simplify. Energy-Efficient Mortgages (EEMs) give borrowers the opportunity to finance cost-effective, energy-saving measures as part of a single mortgage and stretch debt-to-income qualifying ratios on loans thereby allowing borrowers to qualify for a larger loan amount and a better, more energy-efficient home. To get an EEM a borrower typically has to have a home energy rater conduct a home energy rating before financing is approved. This rating verifies for the lender that the home is energy-efficient. EEMs are typically used to purchase a new home that is already energy efficient such as an ENERGY STAR certified home. There are various types of EEMs, including Conventional, FHA and VA programs.